Professional gel pre-workout designed for professional athletes and active people engaged in heavy physical exertion. Fast recovery and growth are now at your fingertips! Innovative gel post-workout, so that you will be able to achieve much greater gain in muscle mass. Significantly accelerated regeneration is critical for the outcome of sports. Excellent composition combined with an interesting taste and ease of use - all you need. FA Vitarade® Recovery Gel fueled by Vitargo® is designed for professional athletes and active people engaged in heavy physical activity, who are looking for a way to optimally fast and effective recovery. In order to ensure the rapid recovery of the body done after a heavy training session, competitions or sports competitions should be completed as soon as possible any loss of nutrients that have occurred during intense exercise. This means that you must first replace lost muscle and liver glycogen, as well as cover the increased need for protein as a result of intense exercise performed. The addition of protein to carbohydrates speeds up glycogen recovery and a positive effect on nitrogen balance. Increasing nitrogen balance is necessary to halt catabolism (breakdown) and increase post-exercise muscle protein synthesis. This leads to rapid regeneration of muscle micro-injuries and optimal adaptation of the training of the body including through an increase in the synthesis of mitochondrial proteins and contractile proteins of muscle cells. The best solution is therefore to provide a single product (Vitarade® Recovery Gel fueled by Vitargo®) sources of well-absorbed carbohydrates along with the right dose of protein, which will guarantee a very quick post-workout recovery of the body. Until now it was not available on the market, no product, which in concentrated form would provide all the necessary nutrients. 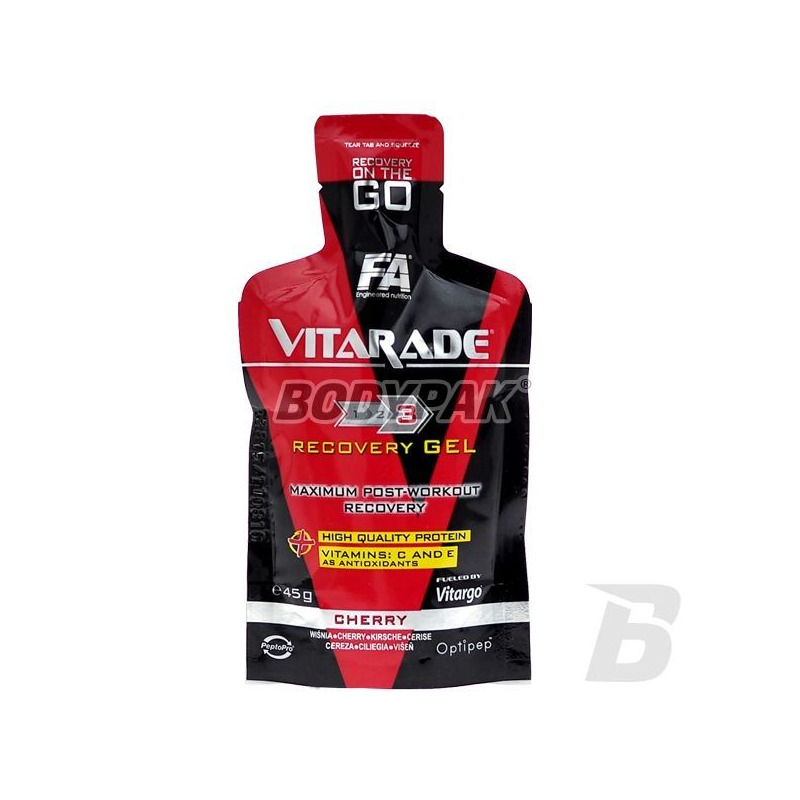 FA Vitarade® Recovery Gel as the first gel on the market, provides an optimal dose of carbohydrates and proteins provide a very fast and efficient recovery. Contained in Vitarade® Recovery Gel macromolecular carbohydrates and maltodextrins secure a quick and lasting recovery resources muscle and liver glycogen. The addition of high-quality collagen protein hydrolyzate enables a positive nitrogen balance necessary for the rapid regeneration of muscle proteins, as well as fast adaptation exercise of the body. 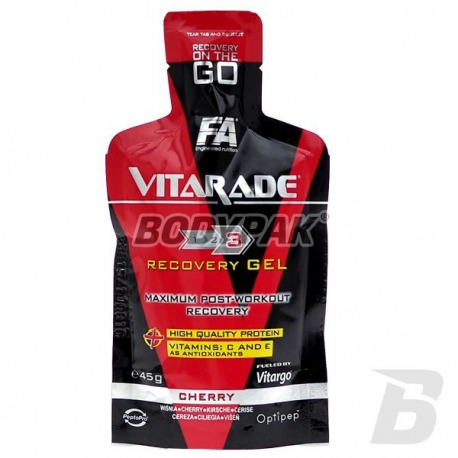 FA Vitarade® RECOVERY GEL fueled by VITARGO® - ATTITUDES IN proven formula!